ECOPAC are proud to be the first UK packaging distributer to convert their stock range of bubble wrap to an oxy-biodegradable product. The new bubble wrap, manufactured by ECOPAC’s supply partner Sealed Air is green in both colour and performance. Branded Eco-Bubble, the oxy-bio alternative to standard polyethylene bubblewrap biodegrades fully within approximately 18 months of its first exposure to sunlight. After 8 – 12 hours in sunlight the oxidation process is triggered and the long molecules are broken down into smaller linked sections. These linked sections are then small enough to be attacked and digested by bacteria and fungi in the ground. 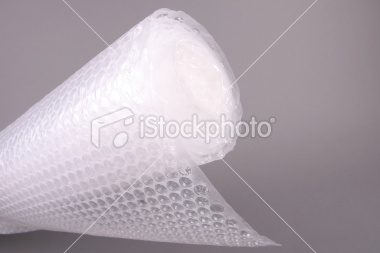 Eco-Bubble has all the performance criteria of traditional bubblewrap. Our bespoke foam solutions can be designed to provide the ultimate protection for your products in transit. Our team of experts can advise you on which material will best suit your application from our range that extends from soft polyester to high performance closed cell polyethylene foams. Having identified the best product for your requirements, our design team will then decide on the method of conversion to give you the ultimate finished product. Our foams can be die-cut, laminated, CNC cut and routed to perfectly fit your product and hold it safely in place during transit. Polystyrene solutions are available either moulded or hot-wire cut to your requirements. ECOPAC also have a bio-degradable air bag system available. Single face corrugated material completed the range of cushioning materials.